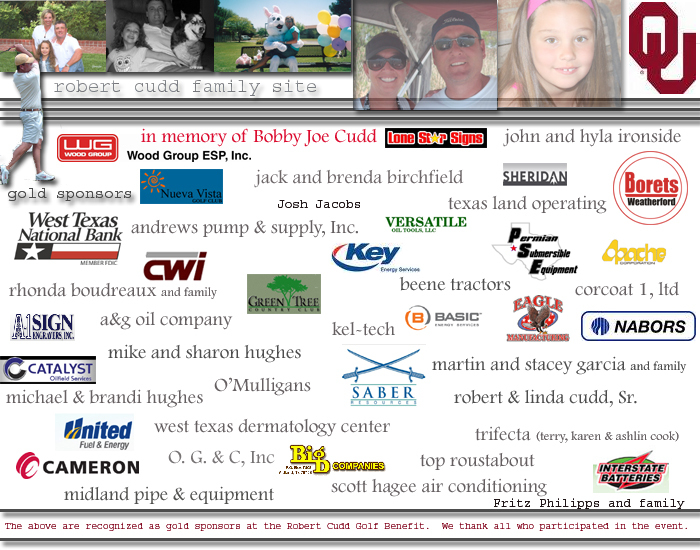 Our friend, Robert Cudd (37), a kind-hearted father and husband, received life altering news on May 4th, 2008. For those of you who do not know, Robert had a melanoma on the upper back portion of his neck removed in 2000. On the morning of May the 4, 2008, while experiencing unbearable headaches he decided to drive himself to the emergency room in Midland, TX. After reviewing his history about the previous melanoma they decided to do a CAT scan. The results of that scan revealed multiple brain tumors. (to see in more detail what Robert has and is going through from his prospective, please visit his blog). Robert was a fun loving individual that lived his life doing for others. He is the kind of guy that always sees himself last and friends and family first. Robert married Kim (Hughes) on October 4, 1997. They had sweet Sydney on March 23, 2001.